In 2018, the Institute for the Development of Education will for the 14th year in a row organize the Higher Education and Scholarships Fair in 3 university cities: Zadar, Zagreb and Rijeka! The Higher Education and Scholarships Fair represents the largest fair of its kind in Croatia and the Fair is now widely recognized both in Croatia and Southeast Europe as a high-profile, not-for-profit educational event presenting institutions, study programs, scholarships/financial aid programs and other educational services to over 10,000 Croatian students, pupils, parents, adult learners and higher education professionals. 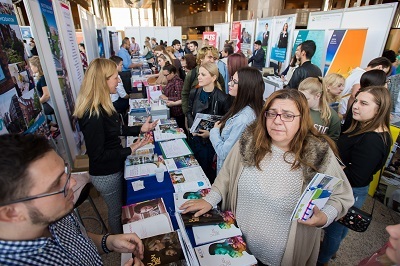 The Institute for the Development of Education successfully organized the 14th Higher Education and Scholarships Fair in Croatia, which was held on Tuesday, 16 October 2018 at the National and University Library in Zagreb, on Thursday, 18 October 2018 at the University departments building of the University of Rijeka and successfully organized the Higher Education and Scholarships Fair in Zadar, which was held on Tuesday, 22 March 2018 at Arsenal Hall. Main Partners of the Fair: To our great satisfaction, we continued the successful cooperation with our long term Fair partners, the University of Rijeka, City of Zagreb and the National and University Library in Zagreb. It is a great honor that the importance of our Fair is recognized by our faithful donors, who enable the Fair each year with their support. We would especially like to thank the Ministry of Science and Education, Agency for Mobility and EU Programmes, the City of Rijeka and Primorje-Gorski Kotar County. We would also like to thank our institutional sponsors: Ministry of Demographics, Family, Youth and Social Policy, Ministry of Economy, Entrepreneurship and Crafts, Ministry of Labour and Pension System, Ministry of Maritime Affairs, Transport and Infrastructure, Ministry of Tourism, Croatian Chamber of Economy, Hrvatski Telekom and RIT Croatia. In addition to 24 exhibitors from Croatia, this year's Fair presented 31 institutions from 15 countries in Europe, North America and Asia. This year's Fair attracted over 7,000 visitors to two cities, Zagreb and Rijeka, of which the largest number of visitors were students and secondary school pupils. Student organizations presented numerous opportunities for international mobility and various activities for the development of skills and competencies that are important for career success. At the fair, activities, projects and programs were presented by 8 student organizations. [PROMO] The Higher Education and Scholarships Fair - Exhibitors from Institut za razvoj obrazovanja on Vimeo. Institute for the Development of Education (IDE) is proud that the Higher Education and Scholarships Fair in 2018 took place in three cities - Zadar, Zagreb and Rijeka. 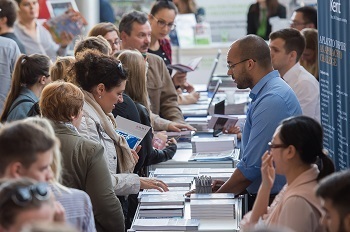 The Higher Education and Scholarships Fair organized by the Institute for the Development of Education is a unique event of national importance which presents study programmes, scholarships and other educational programmes and services available to Croatian citizens in Croatia and abroad. The Institute for the Development of Education (IDE) has organized the Fair every year since 2005 and the Fair is now widely recognized both in Croatia and Southeast Europe as a high-profile, not-for-profit educational event. Higher Education and Scholarships Fair in an non-profit event. All funds remaining after the costs of the Fair are covered (from exhibitor fees, donations, sponsorships, advertising) are used to achieve the goals and conduct activities of the organization Institute for the Development of Education, in accordance with Articles 6 and 7 of the Articles of Association of IDE. The Fair is intended for all those interested in scholarships and other forms of financial aid for study, especially high school students preparing for study, students at all levels of study and young professionals interested in achieving their educational goals in Croatia and abroad. Television: 16 reports were broadcast on Croatian TV stations. The biggest media success of the Fair was the featuring of reports about the Fair in news programs and mosaic shows of the national TV station HRT1, including live coverage in the show Dobar dan, Hrvatska, as well as Z1 television Zagreb, good morning. Apart from the above mentioned, there were also reports on the following local and regional TV stations: HRT, Nova TV, Kanal RI and others. Radio: Total of 13 reports were broadcast, among which were those at the Radio Sljeme, Radio Antena Zagreb, Otvoreni radio, Enter Zagreb, Radio Dalmacija, HR1, Kanal RI and others. National media websites such as Nacional, Lider, HRT, as well as popular news outlets such as poput direktno.hr. The Fair was very well covered by students media nad portals: Srednja.hr, Studentski.hr, srednja.hr, studentski.hr, novine Global, x-ica and škole.hr. News from the Fair were also covered by regional portals such as 035portal.hr, mojarijeka.hr, novilist.hr, ezadar.rtl etc. Institution websites: It is significant that all sponsors of the Fair promoted the event and its pages as well as a large number of Croatian universities and secondary schools. The Fair's promotion campaign also ensured that numerous members of the University of Zagreb and the University of Rijeka published the news about the Fair. The following links lead to information on the results of all the Fairs held so far containing programmes, photos, reports, media clippings, etc. The document contains an overview of the Higher Education and Scholarships Fair 2018 results presented through statistical data gathered from the exhibitors and visitors at the Fair and through the evaluation of specific Fair activities.